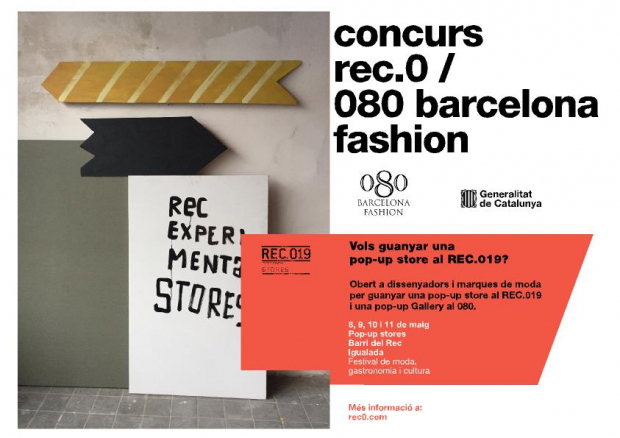 080 Barcelona Fashion and the Rec.0 festival just announced the open call for the 4th edition of their design contest for emerging brands and designers. It’s an initiative within the mission of both organizations to give support and visibility to the young talents in fashion of Catalonia. This year’s novelty is that winner will receive a double prize. Besides the usual pop-up store free of charge to participate in the Rec.019 shopping festival in Igualada, that will take place from May 8th to the 11th; it will also be present in the upcoming Pop-ups Gallery of the June 2019 edition of 080 Barcelona Fashion, held at the Sant Pau Art Noveau Site, also at no cost. Like in previous editions, the contest presents a first stage in Facebook, plataform through which the fashion designers and brands can present their projects through April 15th. In this stage, 10 finalists will be chosen by popular vote. In the second stage, a professional jury formed by designer Cristina Fernandez, from Little Creative Factory -last winner ex aequo of the 080 Best Collection Award-; fashion journalist Francesca Tur; a member of the 080 Barcelona Fashion and a representative of the RecStores will select three finalists, among who will be picked the final winner of this 4th edition. The award ceremony will take place on April 25th at the Nu#02 store in Barcelona, the usual setting of other editions. The winner will join a list made by Eñaut, 113 Maison and Killing Weekend, many familiar names of the 080 Barcelona Fashion that have brought renewed vibes to the Catalan catwalk with their emerging talent.